Five top US internet service providers are, as of the 25th of February, now monitoring your internet traffic for torrent activity. As part of the six strikes law, they will send you six warnings. After those, your internet connection will be crippled. This is a fundamental invasion of your privacy. Luckily for you, there are ways to avoid any ‘strikes’. These come in the form of a seedbox and also a VPN. 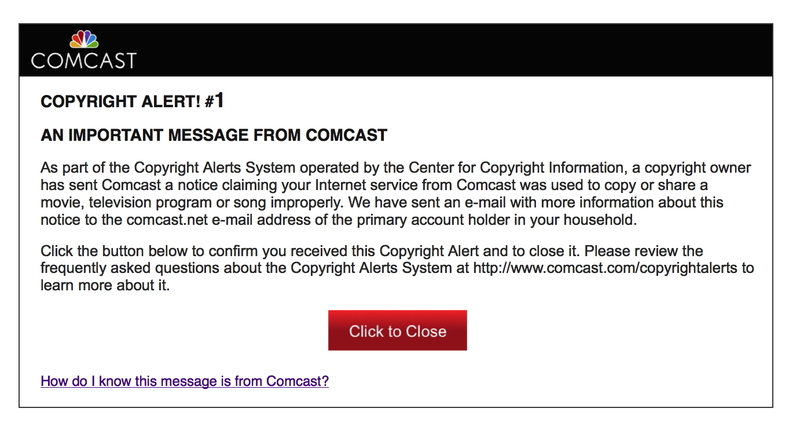 The six strikes system is also known as the ‘Copyright Alert System’. It is implemented by a group called the Center for Copyright Information (CCI). CCI consists of the ISPs Verizon, Time Warner, Cablevision, Comcast and AT&T. It also consists of the Motion Picture Association of America (MPAA) and the Recording Industry Association of America (RIAA). It means that with six strikes ISPs now allow private agencies to monitor your internet usage for copyright infringement. If copyright infringement is found then you will receive up to six strikes. Each strike displays a message in your browser or via letter. To see some example notices, see this article on Ars Technica. The first five strikes are warnings and aim to educate you about piracy on the internet. As part of your sixth strike, your internet connection is significantly slowed down as an anti-pirating punishment. Rather than get a new internet service provider, it’s possible to stick with your current provider and conceal your online activity. Luckily for you, technology moves incredibly quickly and there are already methods to hide your activity from your internet service provider. These aren’t new methods and if you are downloading torrents, you should have been doing this long ago. This is a no-brainer — it is what this website is dedicated to. If you are downloading torrents and you use a seedbox, there is no way that your ISP can monitor your torrent usage as part of the six strikes plan. This is because a seedbox is a remote computer and the torrents are downloaded on *that* computer, not yours. You simply use FTP to connect to the server and download your files. This FTP usage is highly unlikely to be monitored by the six strikes copyright police. Please, read our article explaining seedboxes: ‘What is a seedbox?‘ and use our seedbox comparison tool to find the cheapest seedbox or the seedbox with the best specification for your needs. Also, if you are concerned about privacy, why not look at our list of seedbox providers that accept bitcoin? Private torrent trackers are often required to be used by seedbox providers. As the name suggests, Private trackers are normally “invite only” (Receiving an invitation from a member already signed up). Because of this, they are much more secure to download from because it is highly unlikely that fake (baiting) torrents will be uploaded by six strikes enforcers. Check out Opentrackers.org for great up to date information about torrents and private trackers with open sign-ups. If you have a seedbox, you are one step in the right direction. As you may have noticed, I wrote that ‘FTP usage is highly unlikely to be monitored’. This is because it is possible to monitor that traffic and it could happen in the future if rights holders become more savvy to seedbox usage. The solution to this monitoring is a VPN. A VPN sends all your internet traffic through an encrypted channel to another computer. This other computer sends out your request and sends you back the data still in an encrypted form. This means all your ISP and potential monitoring agencies see is how much traffic you use, not what you are using it for. So if you use a VPN and a seedbox, firstly you aren’t downloading any torrents on your home connection. Secondly, when you are downloading files from your seedbox, you are doing it through an encrypted VPN connection which no one can intercept. Possibly the most renowned VPN host. They take privacy seriously and accept Bitcoin. They use OpenVPN which is highly secure. A stellar NO logs policy, 256-bit military-grade encryption and a global network of 550+ servers. Another torrent friendly provider. They will not log or monitor your activity. For posterity, there is a permalink to VPN providers in the menu bar now that contains the above information. We will update it with more services soon and potentially provide a similar interface to our seedbox guide. Additionally, TorrentFreak has compiled a list of VPN providers that do not store information that is traceable back to your personal identity. Please discuss any issues you have or comments about six strikes in the comments below.